Hey beautiful people! It's Monday again, and I know you're excited for another Monday Must-Have post. If you missed last week's, you can read it here, but if you've already gone through that one and are ready for this week carry on. (I hope that song by Kansas just started playing in your head, because it did in mine. "Carry on my wayward son... there'll be peace when you are done....") So I'm really excited about this week because it's going to be all about how to survive finals week, like a boss! Mainly because I have a few finals this week at university, and some of you might have finals as well, or know someone who can greatly benefit from this! Like always, the same categories are going to be explored: sports, social media, hair and makeup, fashion, and music. This week's sports section is about the Premier League Football (Soccer) game I was able to watch over the weekend. 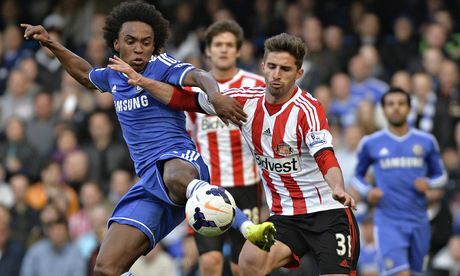 The match was between Sunderland AFC and Chelsea FC. In the final minutes, Sunderland, who was last on the league table, pulled out the win over Chelsea, who was second on the league table. With the Premier season winding down, I am definitely going to be watching as many games as I can between studying, using the games as background noise to study with, and then after all the tests are over, enjoying my Saturday watching the games. I support Cardiff, who are also quite bad, so I'm hoping for a game like the Chelsea game for us this week. If you like soft puppies, baby otters, and cuddly animals, the Twitter account Emergency Cute Stuff is for you. 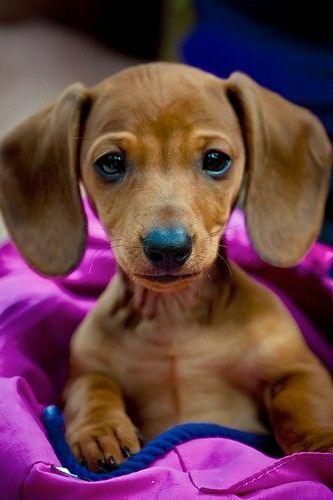 They post daily pictures of cute puppies or other types of baby animals that will make your heart so happy while you're studying for the hardest final of your life. Just go follow them, you won't regret it. I really hate being fussy about my makeup. My daily routine is Maybelline BB Cream, Rimmel London Stay Matte Powder, a brown eyeliner, some sort of semi-neutral eye, and whatever mascara I have at the moment. It sounds like a lot, but it takes maybe seven minutes to do my makeup in the morning. But the best thing I can have is my Real Techniques: Expert Face Brush. No matter what look I'm going for, or what type of base I'm putting on my skin, whether it's a full coverage foundation or a BB cream, this brush is my new best friend. I found out about this brush from YouTube beauty vlogger Tanya Burr (who I love and you should go check her out!). I continued to do a bit more research because as much as I trust Tanya's opinion I needed more info before I bought the brush. Well the reviews on a few different websites were so good, so I went out and bought the new tool, and I am so happy with it! Even during finals at university you should try to look your best, because I hear the way you dress can affect your test-taking ability related to confidence. Though I don't know how true this is, I'm willing to do just about anything for a few extra points on a final. I got my brush at Ulta. So finals are over, it's Friday afternoon and it's time to celebrate the end of a hard semester that you worked really hard to keep up with and to celebrate the beginning of Summer vacation! The best dress I've found for this is from a small boutique in a town close to mine. This maxi-dress is so bright and flowy that it can easily transition from Spring to Summer. I love the color and the tribal print bodice of the dress as well. I've paired it with gold accessories, just because I think gold makes my tan look better. I've got some gold knuckle rings, earrings, and a watch that all go with this. I really like to take pieces like these that have feminine touches and add a bit of a rougher rock edge to them, which is done with the knuckle rings. If you haven't heard of NEEDTOBREATHE then you are really missing out on one of the best bands in the world! They were featured on Ellen last week, and their new record just dropped. I haven't bought it yet, but next time I get paid it's first on the list. I did however listen to the song "Heart" from the new album called "Rivers In The Wasteland" and if that is what the whole album is like then I, and you, will be in for a real treat. I have also had the chance to see NTB live with Emily from Tales From An Emmy. We were in the second row on the isle, and let me just tell you it was one of the best concerts I've ever been to, and I've been to a lot of concerts (Carrie Underwood, Maroon 5, and Brad Paisley to name a few). So that's it for this week's Monday Must-Haves. I hope they help you get through the last week of classes if your finals are this week like mine, or they can help you push through the last few weeks before classes end for the semester and Summer is here! Have you tried any of my Monday Must-Haves out from this list, or a previous week? Let me know!